Articulate and broaden the curriculum in terms of competencies and experiences to meet the needs of tomorrow’s learners and citizens. By marrying the development of timeless academic and personal skills (e.g. oral and written communication, research, critical thinking, teamwork) with the generation of curriculum that cultivates emerging competencies (e.g. creative expression, systems thinking, data fluency, scientific and mathematical literacies), Hackley’s program will continue evolving to serve the future needs of our students. Identify and ensure the continued emphasis of enduring knowledge and skills throughout the curriculum. Develop emerging competencies aligning with the Portrait of a Graduate. Create opportunities for interdisciplinary and multidisciplinary teaching and learning. Interesting and complex problems and questions often lie at the intersection of disciplinary boundaries. 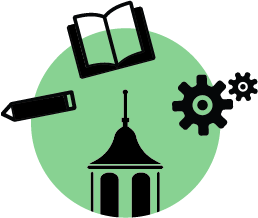 While continuing to develop deep discipline-based knowledge, Hackley will expand curricular offerings across academic boundaries to better prepare students for a life of continuous learning. Explore real world project-based learning K-12 to create formative interdisciplinary and multidisciplinary experiences throughout the curriculum. Prioritize the development of interdisciplinary and multidisciplinary courses in the Upper School. Identify the time and resources needed for additional interdisciplinary and multidisciplinary collaborations, including those supported by distinctive course models (e.g. trimester, pass/fail, “J-Term” ). Develop research centers within and across disciplinary boundaries, based on the multi-year model of Hackley’s Independent Research Program. Expanding on the Science Department’s Independent Research Program, Hackley will develop opportunities for Upper School students to pursue research in other disciplines with support from Hackley faculty and other experts. This approach strengthens the curriculum while developing independence and promoting academic scholarship. Develop a network of mentors/experts to help students see research projects to fruition. Identify opportunities to create research centers in additional disciplines informed by student interest. Deepen Hackley’s focus on students’ local, national, and international responsibilities. Hackley will develop a student’s sense of responsibilities as a member of a democratic society and integrate these into the K-12 curricula. Through experience-based opportunities including service, travel, and engagement with local government, Hackley seeks to teach and cultivate a sense of civic and global responsibility independent of political views. Create a comprehensive approach devoted to civic and global responsibility in alignment with Hackley’s mission. Enhance K-12 engagement in political and social discourse to help students learn and practice communication skills across differing viewpoints and perspectives. Examine and reframe assessment practices to best support desired learning competencies and experiences. Through a holistic examination of assessment practices, faculty will consider and implement additional modes of assessment (e.g. project-based learning, portfolios) to reinforce curricular competencies and encourage deep learning. Identify in-house best practices and create dedicated time for faculty to learn from each other. Research best practices and trends in assessment, examining the link between mastery, depth, wellness, and assessment.